Barcelona superstar Lionel Messi managed to achieve an impressive feat during his mesmerising display against Manchester United this evening. Messi was unstoppable. Messi became the first player since Tottenham’s Heung-Min Son to score from outside of the box with both his left and right foot in a Champions League game. Son achieved the feat in November 2014 and after a five-and-a-half-year wait, Messi has matched the South Korean’s excellent achievement. Messi opened the scoring for the Blaugrana in the 16th minute of the clash with a truly world-class strike. 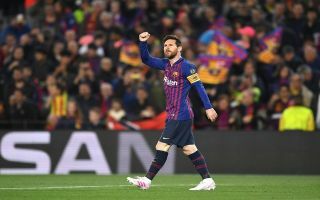 Messi benefitted from a stroke of luck in the 20th minute of the tie, the ace’s ordinary strike on goal hit the back of the net after a disastrous blunder from David De Gea. Take a look here. #OJOALDATO – Messi ha marcado desde fuera del área con la izquierda y con la derecha en un mismo partido de Champions League, algo que no lograba nadie desde hacía 5 años: Son Heung-min con el Bayer Leverkusen frente al Zenit, el 4 de noviembre de 2014. Messi was superb tonight, the five-time Ballon d’Or winner looked unstoppable against the Red Devils. Barcelona were sensational against United tonight, Ernesto Valverde’s side have to be considered the favourites for the Champions League after that display.